Spring Has Sprung in Burgundy with sunshine and the temperature edging up to the mid-teens. We spent most of the day on the deck of our house, La Maison des Chaumes, which would have been relaxing if it didn’t mean that Clem discovered a whole new and thrilling universe of Dangerous Things To Do. This entry was posted in Parenting the French Way, Snapshots of French Life, Vacation Rentals R' Us on February 28, 2009 by admin. Don’t let anyone tell you that parenting is easy. Yesterday, it had me in tears. Charlotte and Camille are home from school on vacation this week. I had promised them I would do Shrinky-Dink jewellery crafts that I (short-sightedly) brought home for them from Paris. I entertained a halcyon image of the four of us spending a nice, crafty, female bonding day together. I was a great mother; it was going to be perfect. First wrinkle in the plan – Clem woke up yesterday morning piercing two molars. From the moment she entered consciousness, she expressed her rage at the universe by opening every cupboard in the house and emptying its contents on the floor. Repeatedly. She did this while screaming like a banshee. Whenever she felt that my attention was being diverted from her existential angst, she would storm over to where I was trying to cut out coloured Shrinky-Dinks and take a big chomp out of my leg. As the morning wore on, and I struggled to thread little Shrinky-Dinks onto stretchy elastic cords while Clem took chunks out of my kneecaps, I began to mentally beat myself up. Why can’t you ever seem to get a handle on this parenting thing? A nasty voice in my head demanded. Why is a day with my three girls making me feel woozy with anxiety and dread? Why does the idea of getting lunch on the table feel as exhausting and impossible as running a marathon? Why is everyone better at this than me? And then came the kicker: What is wrong with me that I can’s get this right? One of my closest friends here has a baby of the same age as Clem, and just like me she has days where she feels like she is going off the deep end. However, on such days she doesn’t seem to have to contend with feeling like a “failure”, unlike yours truly. I know this, because I’ve straight out asked her. “But doesn’t that make you feel like a failure?” I ask. Huh. Tell that to the voice in my head. Just as I put Clem down for her nap (needed by Her Grumpiness, but MUCH more needed by me) and sat down with my beloved cup of after-lunch coffee, Franck got home from Beaune. He had been working on the cellar so needed to clean his tools. This involved turning on and off the outside faucet which, unbeknown to him, made huge clunking sounds in the nether regions of the house. Clem woke up screaming, and I, I am not proud to say, went absolutely ballistic on my husband. Even as I was freaking out on Franck, my internal monologue became a two-part harmony. Not only did I accuse myself of being a failure as a mother, but also a failure as a wife. Why was just getting through a day so hard? Something was clearly wrong with me. Everyone else was a more successful parent / spouse / person than me. And this was not my first child, but my third child – I couldn’t get away with the “novice” excuse anymore. Clem never did go back to sleep, but I eventually calmed down into silent misery and martyrdom once again. Franck tried to take on the brave task of asking me what the real problem was. “I just feel like I’m doing it all wrong!” I yelled. Thank God for that. If it was I don’t think I would have even earned a “Participation” ribbon yesterday. The evening culminated in an exhausted me giving Clem a bath. After changing her into her pyjamas – a contact sport these days, as she’s really not into clothes – I was holding her in the hallway, yelling something at Franck as I simultaneously slammed the girls’ bedroom door shut (I spend about 2 hours every day simply shutting doors so that Clem doesn’t find things to choke on / cut herself / destroy in the bedrooms and bathroom). There was a a sickening crunch, followed by an unearthly wail. My stomach heaved. Without me noticing Clem had stuck one of her little fingers into the door jam, and I had slammed the door shut on it. Clem screamed in agony. I burst into tears. Franck had to whisk her off to emergency in Beaune to have X-rays and make sure the little finger wasn’t broken. I served the two big girls soup, ignoring their complaints as every thought in my head was pretty much drowned out by the mocking chorus of failure. God knows where I picked up the bizarre notion that one can succeed or fail at parenting, especially at parenting babies and toddlers. However, I happen to know that I am not the only Canadian woman to have internalized, and then to have been beaten down by, the concept. I wonder if the question of how we perform in all aspects of our lives has permeated our psyches to such a degree that we just assume it applies to parenting. One thing I concluded for certain yesterday was that judging parenting in terms of performance DOES NOT HELP ONE BIT. In fact, I’m quite certain it could drive a person insane. Unfortunately those little voices are tenacious buggers, and hard to silence. However, by the time Franck finally got home from the hospital with Clem I had at least resolved to begin working on a more French, non-performance approach to parenting. Clem was smiling happily, after having been stuffed with “ah-toes” and chocolate in the ER waiting room by Franck, and proudly waved around her heavily bandaged finger. I had survived the day. From a French parenting perspective, that was just about all I could ask of days such as yesterday. Temporarily free of my internal judge, I felt instantly better about my kids and myself. Clem was so cute that I went to get the camera to take a photo of her and her bandage. It was a good thing I had adopted Frenchitude by then, because by the time I found it and came back to take the picture, the bandage had disappeared. This entry was posted in Favorite Posts, Frenchitude Fridays, Parenting the French Way on February 27, 2009 by admin. I would say I’m an indulgent wife. After all, I let Franck bring his mistress up to Paris with us on Valentine’s Weekend. Luckily, his maitresse is his beloved Mountain bike, although she has been rather demanding lately; wanting to come on vacation with us all the time. As Sunday morning dawned over Paris Franck decided that after spending the entire day with his wife on Saturday, his mistress was feeling sorely neglected. To assuage her ire, he took her for a ride along the quays of the Seine, which are blissfully closed for traffic every Sunday. Franck came back flushed and contented, as one generally does after spending time with one’s maitresse. Apparently he wasn’t the only one with the same idea. Parisiens of all walks of life have now begun to use bikes to rediscover their cities in an entirely new way. Part of this is due to the “velib” phenomenon (velib’s are the pay as you go bikes you see lined up all around Paris now, as in the photo above ) which began in Paris a year or so ago and has now spread to most major French cities such as Lyon and Dijon. Bike lanes have been created in these towns, and anyone can hope on a bike and peddle around the little lanes and byways. There are also annual biking events being planned where the cities are largely cut off to all cars, and the bikers get free reign. Franck attended the one in Lyon in the Fall, and then one in Dijon shortly afterwards. Franck may in the future incorporate these events, plus a day long bike tour in Paris, into his Grape Trip weeks. If you are interested and would like to find out more information just email me directly. Anyway, back to Paris…Just have a look at what Franck (and sa maitresse) saw on their Sunday morning travels. I hope such sights will appease her for a few weeks at least. This entry was posted in Authentic France Travel Tips on February 24, 2009 by admin. Franck is studying his youngest daughter. “Did you cut her bangs?” he asks me. This entry was posted in Parenting the French Way, Snapshots of French Life on February 22, 2009 by admin. Yesterday was Carnavale here in France. I bid a fairy princess hybrid and Hermione (pronounced Her-me-on here in France) good-by as they went off to school to enjoy a day full of doughnuts (beignets) and candy. I knew if I hung on to my Oxford gown it would come in handy one day. This entry was posted in Parenting the French Way, Snapshots of French Life on February 21, 2009 by admin. Now let’s just get one thing out of the way to begin with – this is one aspect of Frenchitude at which I am a complete and utter failure. Tragically, I cannot blame North American society, my parents, or my schooling for my inability to “do less”. The problem is mine and mine alone. I was born with an insatiable hunger for life. I also seem to have been born without that comforting illusion of immortality some people possess (I have always viscerally understood the sand through the hourglass concept). This means that for as long as I can remember I have tried, on a daily basis, to stuff roughly the equivalent of ten lives into my one. Large, loving family? Yes, I want that. A job I feel passionate about? Yes, I’ll have that too. Time devoted to writing? I simply couldn’t live without that. A life in France? Bien sûr. A life back in my Canadian hometown? That too, of course. And, hey, why don’t I sign up to run a 10K race (more on this soon)? So it goes, so on and so forth, a bit like that old Breck shampoo commercial. The end result is that I spend most of my time dashing around like a fart in a mitt, to borrow my Cousin Sharon’s expression. I frequently get dizzy spells because I forget to breathe. My French friends seem to have the gift, unlike me, to carefully edit their daily activities. They do not feel the need to shoehorn an impossible amount of tasks and challenges into every day. One of my friends has decided her life’s work is about staying home, looking after her children, and cultivating a household that is always warm and welcoming to friends (she succeeds wonderfully). Another works but chooses to limit her activities outside of that so that she can be present to support her sons through their teenage years. Another is single with no children, but has devoted her time, in and outside of work, almost solely to her greatest passion – winemaking. The French seem to be BORN with the understanding that choosing less, instead of more, is completely legitimate. Take the attitude the French have in regards to their children’s after-school activities, for example. Most French parents ask their child to choose the ONE activity that he / she really feels passionate about, and allow them to pursue that and that alone. If the child changes their mind that’s fine, but the old activity is dropped before a new one is added. Our girls are in two activities a week – Judo and Pony lessons, because my inability to forgo a life experience has apparently been handed down. This is a real rarity here, and most French parents think we are a bit nuts (which may not be too far off base). The reasoning is that if you spend most of your evenings and weekends engaged in organized activities you don’t have the necessary time to daydream, play, linger over a meals, and just generally fart around. Free, unstructured time here is seen as being much more valuable than mastering a new skill. The lack of pressure in France to be a Renaissance woman; running marathons, writing novels, managing clients’ portfolios, and baking cupcakes for the PTA meeting, is truly freeing. Yet me being me, I still haven’t taken advantage of this “do less” environment to stop and smell the flowers. However, I do live in the hope that one day I will begin to practise this aspect of Frenchitude and stop flailing around like a gnat on speed. **Frenchitude Fridays (French + Attitude = Frenchitude) give ideas for injecting a bit of frenchness into your life, whether you live in Reims or Raleigh. This entry was posted in Frenchitude Fridays on February 19, 2009 by admin. This entry was posted in Snapshots of French Life, The Germain's European Adventures on February 19, 2009 by admin. Life is a funny thing. Turns out that as I was cheering on my unrequited loves in rugby matches during my high school years at my very British private school in Victoria, Franck was on the other side of the Atlantic, not only playing rugby but religiously watching the 6 Nations Rugby Tournament with his rugby-crazy Pépé Georges. Of course at that time the 6 Nations tournament was actually the 5 Nation Tournament (France, England, Wales, Scotland & Ireland). Italy came and joined in the fun a few years ago. Franck and I went to the Scotland vs. France match at the Stade de France this weekend, and it wasn’t only an Authentic French moment, but an Authentic European moment. When else can you witness first-hand an invasion of the streets of Paris (here Saint Michel in the Latin Quarter) by men-in-kilts? Or be entertained waiting for the RER by a group of slightly tipsy, red beret wearing French rugby supporters from the South West of France? Or be serenaded by bagpipes, and surrounded by be-wigged French people, as you get off the RER at La Plaine? Or be offered a glass of wine from the impromptu French wine stand as you wander over to the gates of the Stade de France? I also had the chance to reconnect with a few of my distant Scottish relations in the photo at the very top of this post. I wasn’t really sure who I was going to cheer for, after all I have a French passport but no French blood (though plenty o’ Frenchitude), and no UK passport but plenty of Scottish blood. The crowd was also dotted with a scattering of very vocal Scots. One particularly hilarious specimen behind us kept up a running commentary of the match in a gravelly brogue, and favored shouting “Ye ahhhhhshhhoooooooooles!!!!! !” every time the Scottish team fumbled the ball. However, this being rugby (a gentleman’s sport) unlike Football (where they have to separate the fans so they don’t slit each other’s throats) at the end of the match all the French fans and the Scottish Fans shook hands and hugged and took photos together. I cheered for both teams, and nobody around me seemed to have any objection to that. How’s that for Inter-European harmony? This entry was posted in Authentic France Travel Tips, Snapshots of French Life, The Germain's European Adventures on February 17, 2009 by admin. Beauty is in the eye of the beholder, they say. If this is true, then the shocking consensus of opinion in many countries of the world is worrisome. There is nothing I hate more than travelling to a distant country only to be offered the same ham sandwich on white Wonder bread cut into triangles that I can buy at home. Likewise, I hate it when I see so many different women sporting the same bleached blond, silicon boobed, pumped lip look. This summer back in Canada I found myself in a room with a bunch of girls whom I had grown up with. They had been just as slobby and imperfect as I was while growing up, but now they had been polished to an identical sheen. They were encased in matching neutral sheaths, they all had straight long blond hair, they all had perfectly made-up (and suspiciously wrinkle-free, seeing as we’re all pushing 40) faces, and those who weren’t naturally blessed with large breasts had clearly gone out and purchased themselves a pair. I felt like I had stumbled into the pages of “The Valley of The Dolls”. I certainly was the odd duck out in my make-up less face (except mascara, which I rarely go without), wrinkled linen shirt, and Capri pants. Is this cookie-cutter appearance what passes for beauty now? I found myself wondering. Personally I didn’t find my former classmates beautiful; I found them quite scary looking to tell the truth. They didn’t look alive somehow, and they certainly didn’t look like themselves – you would be hard pressed to tell one from another. I also was struck by this “cookie-cutter beauty” phenomenon when I was living in the UK, where I couldn’t help but notice that the vast majority of women on TV looked virtually interchangeable; all blond, blue-eyed, pale skinned, and perky. In the UK I found the phenomenon more annoying than scary, but I did fall to wondering how the vast majority of the British population (who didn’t bear even the faintest resemblance to the TV presenters) felt about having this image of blond, perky (and annoying) beauty constantly reflected back at them. Not more beautiful, surely. That’s why I gotta say it – I love the French take on beauty. In France, men swoon and sigh over creatures such as the actress and singer Charlotte Gainsbourg, in the top photo. She’s not blond, not blue-eyed, has no breasts to speak of, yet I have personally witnessed French men (including my husband) with their eyes riveted to the TV set, barely breathing, when she is being interviewed. 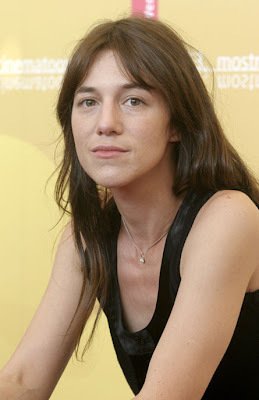 I wonder, though, if Charlotte Gainsbourg would be similarly mooned over by British or North American men? Somehow I doubt it. 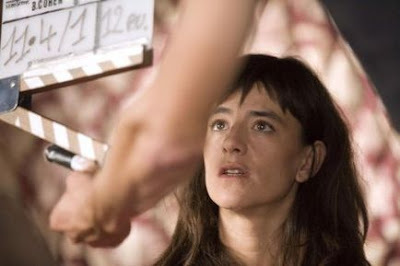 Same goes for another one of my French favorite actresses, Romane Bohringer in the photo below. She is, just like Charlotte Gainsbourg, considered very beautiful and attirante (which literally means she “draws you in”). She is unrepentantly cerebral and temperamental, and is generally considered by French people – men and women – to be one of the sexiest people around. And just take a look at the above photo. This is a shot of my favorite evening TV show – Le Grand Journal on Canal + – which I am going to desperately miss when I move back to Canada. To the left there is one of the show’s popular presenters. I don’t even know her name, but I adore the way she makes the most of her one-of-a-kind face (and nose)with her trademark huge black glasses. She is considered a very attractive woman. I love how here in France beauty isn’t about making yourself look like anyone else, but rather making the most of what you’ve got. It isn‘t a matter of competition as to who measures up the most closely to a widely accepted canon of beauty, but rather of personal expression. Mind you, my five years in France sadly haven’t conferred on me the ability that French women posses to perform this feat. It is all I can do to find five minutes to pull on my wrinkled clothes in the morning and swipe on my habitual coat of mascara. However, I love the idea of living in a country where, if I ever do find the time to make the most of my assets, they will be admired even if they are not remotely blond or silicon. In the meantime, I have invested in a pair of heavy rimmed black glasses. **Frenchitude Fridays (French + Attitude = Frenchitude) give ideas for injecting a bit of frenchness into your life, whether you live in Crow’s Nest or Carcassone. This entry was posted in Frenchitude Fridays on February 13, 2009 by admin. This Christmas I did something very spur-of-the-moment (and I like to think romantic); bought a pair of tickets for Franck to the Scotland vs. France 6 Nations Rugby match on February 14th at the Stade de France. I told him to take a friend and that I would look after the bevy. He, however, wanted to take me of all people. I guess that’s pretty romantic too. Thus began a 2 month odyssey of trying to organize a Valentine’s Day weekend in Paris for the two of us, which so far has been not at ALL romantic. Will we get there??? Here go my prayers up to the rugby gods. This entry was posted in Snapshots of French Life on February 12, 2009 by admin.